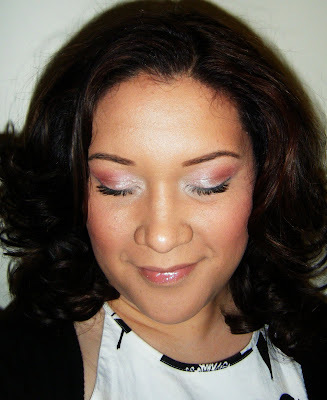 Sweet rosy pinks are great on every skin tone and eye color. Here's a close up shot of the blue wings. See below for details on products used! I can't stress enough the idea of looking BEYOND the beauty counter for your products and tools. There are amazing brushes all over for much cheaper than your department store or Sephora. I LOVE LOVE LOVE Michael's (the craft store) for pretty good quality brushes that are WAAAAYYY affordable. The Loew-Cornell brush pictured above was less than $5.00 at Michael's and it works great! 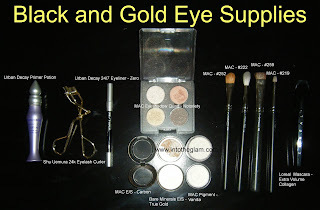 Step by step guide to...Glam it up with Gold Eyeshadow!! 4.Next use the MAC Notoriety Quad to define the shape you are going for. In my pics above I wanted to playup my almond shaped eyes. I accomplished this by using the two lighter shades near the corner nearest my nose and the two darker shades near the end of my eye. 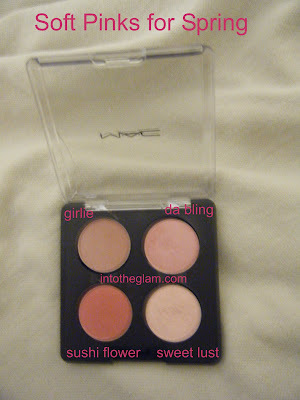 5.I am obsessed with anything that sparkles so I chose True Gold Eyeshadow by Bare Minerals. 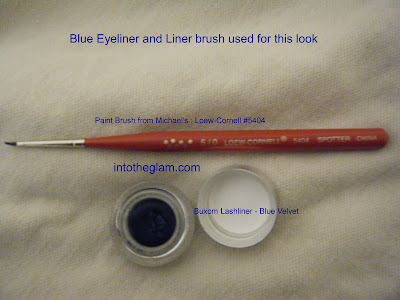 I pat this shade onto the center of my lid from my lashline right beneath the crease using MAC brush #259. This is an awesome gold the closest I have ever seen to the actual color of gold, not too much yellow...its perfect! 6. I used Mac E/S in Carbon to smokeout the corner of my eye. I used MAC brush #222 to define an outer "V" shape. Then making small circles begining at the corner of my eye I worked in towards the center. I have found the best way in creating a smokey eye look is to always start with less shadow on your brush. 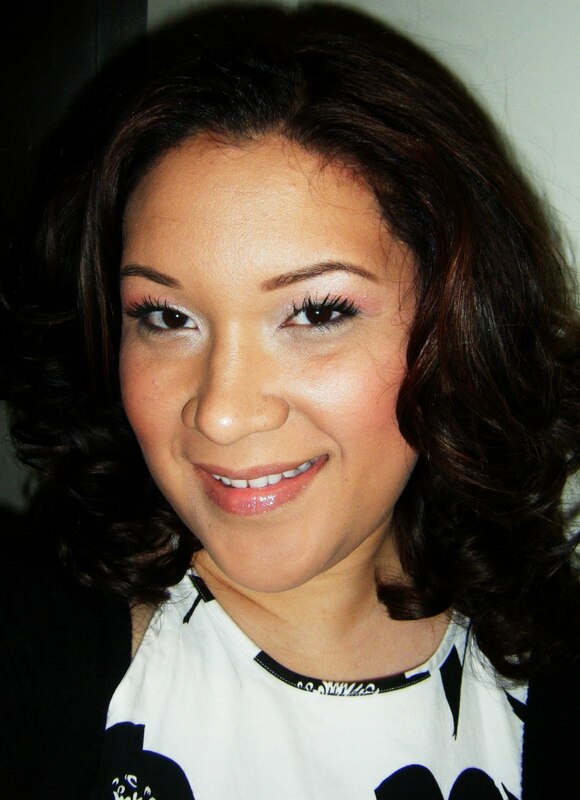 Once you have committed to the shadow placement you can intensify the color as you see fit. 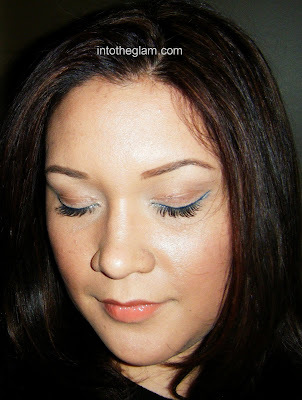 8.Finally give your lashes some lovin. Either apply your falsies and go over with liner. Or do what I normally do and apply 3 GENEROUS coats of mascara. 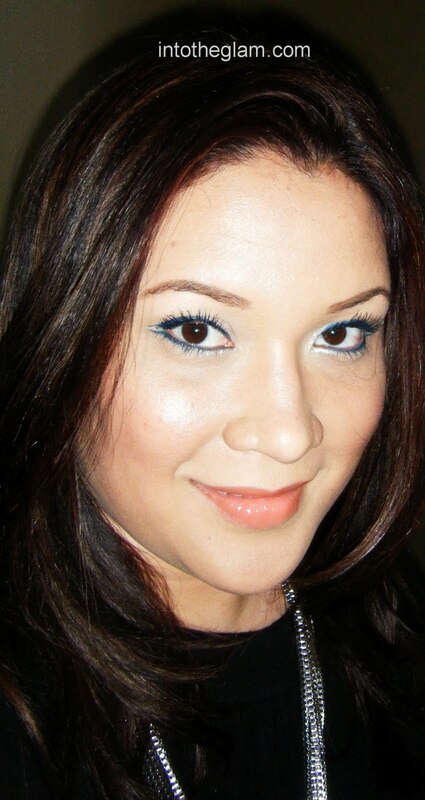 I've been using Loreal Collagen mascara lately and I like it! Gives my lashes a bit of va-va-voom.